South Beach, Everglades, Florida Keys, Key West, and more! 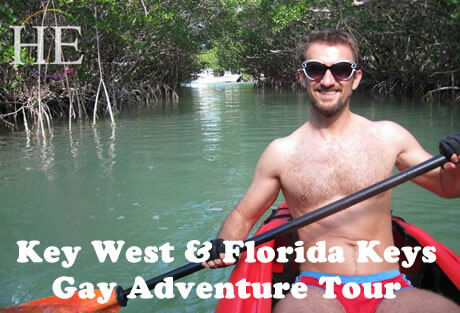 An Adventure Tour of the Fabulous Florida Keys and Gay Key West! Our multi-sport gay Key West tour begins with a tour of South Beach (the southern section of Miami Beach) and the Florida Keys. We will soak in the thriving gay night life of South Beach, then work our way through the Everglades, Key Largo, Islamorada, Big Pine Key, and dozens of smaller islands on our way to the historic town of Key West. We work our way down the Keys (Florida's tropical islands) HE Travel style, with our usual off-the-beaten-path destinations. Enjoy fabulous handpicked restaurants showcasing the excellent local seafood and cuisine of this Cuban- and Caribbean-influenced region. In Gay Key West we will enjoy watersports, a drag show, and much more. Key West is home to colorful and fun locals; a city whose official motto is "One Human Family." Gay Key West is also known for being "Close to Perfect, Far From Normal." • Explore gay South Beach, enjoying the public art, architecture, & eye-candy of this trendy, gay-friendly island city. • Delve into the delicious tropical flavors of the local fruits and specialty wines of southern Florida. • Zip through the unique Everglades ecosystem on an airboat. • Scuba or snorkel to see Christ of the Abyss, a bronze statue submerged in the crystal clear water off of Key Largo. • Kayak through quiet tunnels of mangroves and underneath the bridge to nearby Indian Key. • Bicycle southwest along the Overseas Highway, through areas of native plant life as well as immaculately landscaped subtropical gardens. • Marvel at the expanse of shallow, shimmering water dotted with hundreds of islands and mangrove stands from the tiptop of the Seven Mile Bridge. • See endangered Key Deer in their native habitat (just a few of the thousands of islands host this rare species). • Wind your way through back-country scenery on a private, clothing-optional, gay paddleboarding tour. • Experience one of Key West's famous drag shows and dive into the gay club scene with a local guide who can introduce you to everybody! • Live it up aboard a catamaran which sets sail for an all-day adventure full of jetskiing, parasailing, snorkeling, and just goofing off in the water. • Eat, play, and stay at gay-owned and gay-friendly restaurants, bars, and businesses throughout the tour. The Keys and especially Key West are tremendously welcoming of gay visitors who come from around the world to enjoy the warm, accepting atmosphere in addition to the amazing natural beauty of the island. • For those who'd like to spend another day in paradise, we are offering an optional extension to visit Dry Tortugas National Park, a pristine island 70 miles west of Key West, and site of 19th century Fort Jefferson. See details under Extension. Guests should fly into the Miami or Ft. Lauderdale airports, for a transfer to our lovely hotel in chic, trendy South Beach (the southern portion of Miami Beach). Those arriving early may want to stroll along the waterfront Art Deco district, meander past the gardens and fountains of the pedestrian shopping plaza, or simply enjoy a coffee and pastry under the palm trees while feeling the buzz of this bustling island city. After a 6 pm orientation together at our hotel, we will head to a local gay-friendly restaurant for our welcome dinner. 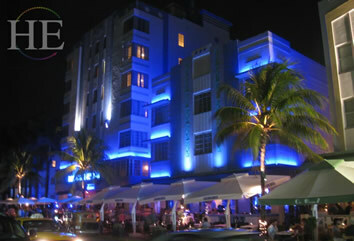 Afterward, we'll discover some of the dazzling gay nightlife that South Beach has to offer! We will have breakfast at the hotel this morning before departing for an airboat tour of the Everglades, as well as a kitschy, informative presentation on alligators, crocodiles, and snakes native to this unique habitat. Lunch today will be at a restaurant which makes great use of the abundant local produce from the acres of farmland in southern Florida. After lunch we will visit Schnebly Winery and Brewery, the southernmost winery in the continental United States. We'll taste an assortment of wines made from tropical fruits (such as lychee, guava, and starfruit) grown on Schnebly's property. We may also swing into "Robert is Here", a fruit stand where shoppers can find strange and exotic fruits grown nearby, some of which are never found in mainstream grocery stores. Visitors may want to enjoy a starfruit, sapodilla, or dragonfruit smoothie; pick up a jar of passionfruit preserves or a guava pastry; or grab a stick of alligator jerky for the road. We'll leave the mainland this afternoon and travel a short portion of the Overseas Highway. This famous 127-mile road has 42 bridges that connect dozens of islands all the way to our final destination, fabulous Key West. Dinner will be on our own tonight after checking into our lovely Key Largo hotel. After breakfast at our hotel, we will spend a portion of our day snorkeling in the aquamarine waters off Key Largo. Weather permitting, we will visit the famous bronze statue Christ of the Abyss (submerged under the crystal clear water) and explore the wildlife and beauty of the coral formations at Dry Rocks. We’ll eat lunch together today and later enjoy happy hour at the Tiki Bar. Dinner tonight is at Key Largo’s best Thai and sushi restaurant, where the ambiance is intimate and the cuisine, delicious. We’ll return to our Key Largo Hotel. The Overseas Highway has many dedicated sections of bike lanes and bridges, or wide shoulders for bicyclists to truly take in the spectacular seascapes. The dappled turquoise and aqua waters of the Atlantic Ocean to the south and the Gulf of Mexico to the north can be as gentle as any lake. You may occasionally see whitecaps in the distance, but the "surf" here is generally very calm, which makes for perfect kayaking conditions. In fact, let's do that today! We'll take a short ride from our hotel, stow our bikes at Robbie's Marina, and pick up our paddles to explore the mangrove tunnels nearby. We may get to see one of the wild (and endangered) American crocodiles who call this mangrove stand their home, as well as native birds who relax among the exposed roots. At low tide, tiny crabs can be seen overhead in the tree branches, and purple sea sponges can be spotted just below the waterline. If time and weather permit, we will paddle under the bridge, south-east to Indian Key, an 11-acre island that still has streets and ruins from its 19th century town. At Robbie's, we'll certainly meet the pelicans who loiter at the docks, waiting for a treat from the fishing boats that launch daily. Tarpon are massive game fish (growing up to 8 ft long) native to the area, and the dock has a feeding enclosure where guests get to see them (and the smaller, faster Jacks) up close. After lunch together, guests have the afternoon free to explore nearby islands or beaches, or simply relax with a cocktail near the pool, with dinner on our own tonight. Restaurants in the Keys are well-known for preparing fresh, locally caught fish such as snapper, grouper, and dolphin. (Visitors can get pretty concerned about this until they learn that dolphin fish is another name for mahi-mahi!). We’ll tonight in one of Islamorada’s lovely beachfront hotels. Breakfast is at the hotel this morning, and bags will be transferred to our next lodging. We have a long and beautiful bike ride today, with cyclists able to stop and visit various suggested scenic spots, beaches, cafes, and restaurants at their own speed along the way. On the many bridges, cyclists can stop and peer into the pristine water, where we might see sea turtles and schools of fish feeding near the pylons. We'll plan to regroup for dinner together tonight at one of Marathon's excellent local restaurants, and share our stories from the day. After a hearty breakfast, cyclists will prepare to cross one of the prettiest (and certainly the most famous) stretches in the Keys, the Seven Mile Bridge. The topmost spot on the bridge provides one of the most breathtaking ocean views in the Keys. Lunch is on our own today, and those with time may choose to detour on Big Pine Key or No Name Key, home to the tiny, endangered (and adorable) Key Deer who are native only to this very small area. For a bit of casual, southern Florida fun at the half-way point, stop at the local mini golf course. This themed golf course is landscaped in lush sub-tropical foliage and flamboyant winter-flowering plants and could be a fun break from the saddle. We'll reach Key West this evening and check into our charming gay-friendly lodging. New visitors to Key West are pleasantly surprised at how gay the town really is, and not just in number of clubs, but also in how free couples feel to walk around town holding hands, sunning together at the beach, or sharing a cozy dinner at any restaurant in town. Tonight we'll dine together at one of Key West's best restaurants (it's so hard to choose! ), and we'll take in a drag show at one of the many gay hotspots in town. Day 7 - Gay Key West and Clothing-Optional Paddling! We'll enjoy getting out on the water today with a gay, clothing-optional, back-country paddleboarding tour. This is a workout, and we'll be sure to pack plenty of snacks and fresh water. We'll have lunch together today, and then give you the afternoon and evening to explore this unique, colorful, gay-friendly town. We have some great suggestions for touristy sights worth seeing, and we'll give you the 411 on the hottest gay destinations for visitors and locals alike. We will spend the last day of our gay Florida Keys adventure playing in the water! Take an all-day watersport-cruise and experience the thrill of jetskiing, take in breathtaking views while parasailing, snorkel at the coral reef, and sunbathe on the deck of the catamaran. Breakfast, lunch, and drinks are included during the tour. Bring your sunscreen, towel, and waterproof camera! The party is on today! For our male guests, you will receive day passes to the Island House, world-famous gay men’s resort, for their famous clothing-optional Bone Island Bare it All Weekend Pool Party and festivities. Lunch is on your own today; many will choose to dine in at Island House’s full-service restaurant and bar. After the party, take a short disco nap or just rinse and repeat before meeting with the group for our farewell dinner! We love having visitors in our town! We hate to say goodbye! But today is the day... Unless you stay just one more day. See the Extension for more info about a trip to Dry Tortugas National Park. In the morning, we will provide a transfer to board a seaplane flight (40 minutes duration) out to Dry Tortugas National Park (70 miles west of Key West). We will spend the day snorkeling the pristine, crystal clear water; exploring 19th-century Fort Jefferson; and sunning on the beach. Boxed lunch and snacks will be provided. We will return to our hotel in the afternoon and enjoy an afternoon at leisure. Enjoy dinner together at another of Key West's intimate local restaurants, before retiring (or not!) for the evening. Breakfast is at your leisure this morning, with many convenient flights departing throughout the day. • Sports equipment rental for activities described. • Gratuities for guide(s) and HE Travel host. • Entry cost at National Park. This tour starts in Miami Beach (also called South Beach) and ends in Key West, Florida. Miami International Airport is the closest airport to our starting point in South Beach, with Fort Lauderdale being about 20 miles farther away. Key West International Airport now has a wide variety of flights on most major carriers. The Florida Keys are home to rich and diverse wildlife, exciting watersports, gorgeous ocean vistas, and one of the friendliest gay cities in America: Key West. Our adventure offers snorkeling in shallow waters, two days of bicycling (30-50 miles, flat terrain, racing bikes with dropped handlebars), two-person kayaking in gentle ocean conditions, thrilling jetski rides, serene and marvelous views while parasailing, and playful fun in the sparkling turquoise water.